Steve Larkham has one of the most dedicated trophy cabinets in world rugby and is perhaps the greatest flyhalf the game has seen. The moment that he is most famous for is the 45 meter drop goal made in the 1999 World Cup semi-final – a campaign defining moment for the Wallabies that has become rugby folklore. In 1995 Steve was chosen for the ACT Brumbies. He made the most of his opportunities in the Super 12 competition and caught the eyes of national selectors. Steve made his Test debut in Sydney against Wales in 1996 before touring Europe on the famous undefeated tour. Coach Rod Macqueen made a genius decision to have him replace injured Matt Burke at full back. The decision was a catalyst to get the Wallabies on track for the 1999 World Cup. Over the course of his career, Steve was consistently of the best Wallabies players. He made a stellar partnership at half-back with George Gregan, both of whom were also team mates as inaugural ACT Brumbies. The two retired, following the 2007 Rugby World Cup, as the most-capped Wallabies in history. With 79 matches, they also played in more Tests than any other scrum/fly half combination in history. The two were recognised by the naming of the Gregan-Larkham stand at Canberra Stadium. In addition to his 1999 World Cup triumph, he also played in a second final, won two Super Rugby titles, a tri-nations series win, and several Bledisloe Cup victories. 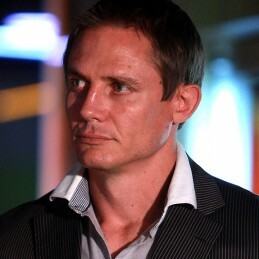 In 2005 Steve was named in the Wallaby Team of the Decade. A true man of the people, Steve is a well-respected member of the community, spending much of his time with charities including McHappy Day and skin cancer awareness.